BALTIMORE (CNN/WJZ) — If you’ve already filed your taxes before the April 15 deadline, there’s definitely a reason to celebrate. If you haven’t filed yet — Tax Day can be stressful, especially when you’re scrambling to find documents and fill out forms at the last minute. Here are some places that believe you deserve a reward on April 15. If you’re a DD Perks Rewards member, Dunkin’ is offering a Medium Hot or Iced Coffee for $1 all day, at participating locations. Bonus: Every Monday this April, rewards members can can also score a free order of hash browns. Boston Market is offering a $10.40 meal deal. It includes half a chicken, sides, cornbread and drink. You don’t need to leave the couch for this deal. Get $7 off your first AmazonRestaurants order with code EAT7. Get the Big Bagel Bundle (13 New York–style bagels with two tubs of cream cheese) for $10.40 at Bruegger’s. 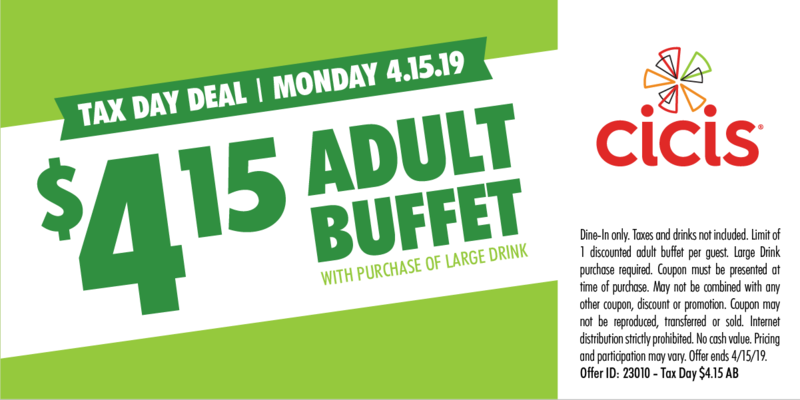 Purchase a large drink, and get an adult buffet meal for $4.15 on Tax Day. Redeem the coupon here. Stay on the couch and get food delivered. DoorDash is offering $20 off on any order for new customers through April. Get a free Original Chocolate Chip Cookie on April 15 at Great American Cookies. No purchase required. Kona Ice in Baltimore is celebrating Chill Out Day by handing out free shaved ices to help folks relax on Tax Day. Find participating hours and locations at www.kona-ice.com/chill-out-day. Sign up for NoodlesREWARDS by April 9 and receive $4 off online and mobile orders of $10 or more from April 10 to April 15. Get a BOGO free entrée on April 15 when you mention that it’s Tax Day. New customers get a $25 Seamless credit through April. Download the Smoothie King’s Healthy Rewards app, and score $2 off any 20-ounce. Participating Hardee’s will allow taxpayers one free sausage biscuit from 7 a.m. to 10 a.m. You just have to say “made from scratch” to receive the giveaway. On Tax day, Schlotzsky’s is offering guests one free small Original sandwich with the purchase of a medium-sized drink and chips. Applebee’s $1 deal on Strawberry Dollaritas with Twizzlers is back for Tax Day and all of April. Firehouse Subs will give you a free medium sub sandwich if you buy a medium or large sub with chips and a drink. The offer is good April 15 through 17. Participating Red Lobster locations are offering 10% off any to-go order now through April 21 using the code LOBSTER65.